Today Jen lives in Orlando with her hubby, John, and their cats Tonks and Lily. She enjoys dessert first, quoting Ghostbusters, and flaunting her flaming geekiness on her other blog, Epbot. 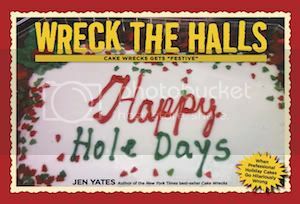 If you've ever been offended by Cake Wrecks, chances are john wrote the post. He's very sorry. When he's not sifting through email and comments, john enjoys not sifting through emails and comments. And talking about himself in the third person. And playing air-drums with his cats. And singing show tunes like "Popular." But in a manly kind of way. Anne-Marie lives in Maine. She is very cold. If you've ever sent us a photo of a cake, Anne-Marie is the first to see it. She enjoys Pina Coladas and getting caught in the rain. This bio is being written by her brother John, who has no idea if any of that is true. But he's pretty sure she likes tequila.